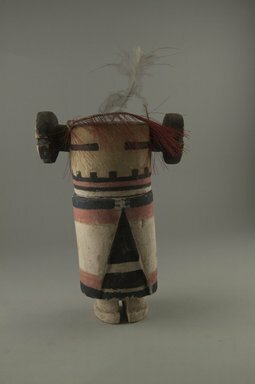 This Kachina doll is probably Qotsamanavitu, Snow Maiden. The doll characteristically has no arms and is carved with a cylindrical body. The head has two spools (similar to the historical hair style worn by unmarried Hopi women.) This Kachina accompanies the Hemis Kachina during the Niman ceremony-performed at the mid-summer and ends the Kachina cycle. The Hemis sing in low voices while the Snow Maidens sing in high voices. In the second part of the dance they kneel and play their gourd/rasp violins. Their songs are prayers for rain and a full harvest.